The Duke and Duchess of Cambridge are to visit the Taj Mahal on the final day of their tour of India and Bhutan. 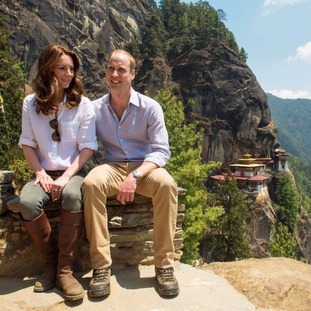 William and Kate will tour the famous building that has become a symbol of enduring love when they fly in from Bhutan. William's mother Diana, Princess of Wales was famously pictured sitting alone in front of the monument to love in February 1992, prompting rumours about the state of her marriage to the Prince of Wales. The photograph became the defining image of the tour and by the end of the year it was announced the couple had agreed to separate. The Cambridges' communications secretary Jason Knauf has said William "is of course aware of the huge esteem his mother" is held in in India and "he appreciates the status of the images that exist of the Princess at the Taj." He feels incredibly lucky to visit a place where his mother's memory is kept alive by so many who travel there. 24 years on from her visit to the Taj, the Duke and the Duchess are looking forward to seeing this beautiful place for themselves and creating some new memories as they say thank you to the people of India at the conclusion of this tour. The Taj Mahal was built by the Mughal emperor Shah Jahan in the mid 17th century, a monument of love to his favourite wife, Mumtaz Mahal. It took 22 years and 20,000 men to erect the building from white marble transported from 200 miles away by elephants. The visit brings to an end William and Kate's seven-day tour of India and Bhutan which has seen them not only visit slums in Mumbai and meet Bollywood stars but forge a firm friendship with Bhutan's Dragon King and his Queen. William and Kate completed their week-long tour of India and Bhutan today. Here we take a look at some highlights of the couple's trip.